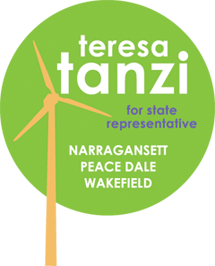 After Teresa's opinion piece "State budget problems kicked down to cities and towns" was published in the Narragansett Times, the South County Independent, and on the political blog Rhode Island's Future, her policy stances continued to be solicited by diligent reporters, on matters of critical importance to the health of Wakefield, Peace Dale and Narragansett. The Narragansett Times' Sarah Traver wrote about the growing concern over the possible closing of Wakefield Elementary and the discussion at the Town Council meeting, on Tuesday, April 27th. Teresa Tanzi said she moved to Wakefield because it had a “walkability” which she stated it even had a score for this online. She said she moved there because she could walk to work, a school, to shop for groceries and all over town. She said she wholeheartedly supported the school staying open. Only a few days later, Tanzi weighed in on the discussion with executive director of the state Economic Development Corp., Keith Stokes. 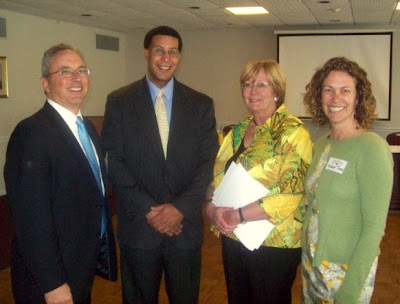 The South County Independent published a report by Liz Boardman on April 29. William Murray Gates IV, who has signed a purchase-and-sales agreement on the Palisades Mill complex in Peace Dale, encouraged Stokes to work to reinstate the historic tax credit, pointing to the EDC’s home office at the American Locomotive Works, a restored mill in Providence, which was restored using the credit. There was no way to measure the return on investment from the tax credit as it existed before, Stokes said. Stokes said the idea was not totally dead – he has been meeting with GrowSmart RI and with state historic preservation officials to discuss how the state might manage a new program that protects the state’s interests. After the meeting, Teresa Tanzi, the newest member of the town’s Economic Development Committee, and candidate for the District 34 seat held by Rep. David Caprio, said she was glad Stokes talked about creating an altered version of the tax credit.